The Department of Justice and Regulation created the form for appointing a supportive attorney. 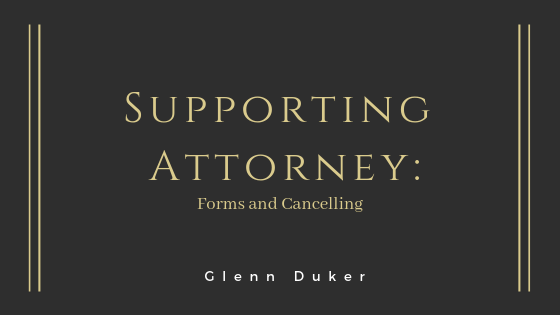 If you are appointing one attorney, use the short form. If you are selecting more than one use the long form. If you are not physically able to sign the form, you can direct another person to sign for you in front of the chosen witnesses. Just like appointing an enduring power of attorney, you will need to sign the form in front of two adult witnesses. One witness must be a medical practitioner or a person authorised to witness statutory declarations. The witnesses can’t include the person you are appointing as your supportive attorney or a person who is signing the form at your direction. The witnesses must not be a relative of yours, a relative of your supportive attorney, a care work, or an accommodation provider for you. Both you and the supportive attorney will sign the form in front of the witnesses. Victoria does not register supportive attorney documents. You should store the original document in a safe place and give your supportive attorney(s) certified copies of the agreement. Someone authorized to copy witness affidavits must make the certified copies. This means they can endorse a photocopy of a form is a complete copy of the original in which you are keeping. You must have the decision-making capacity to cancel the appointment. Once you have completed the Revocation of appointment form, you will need to sign in the presence of witnesses once again. As mentioned above there are eligibility requirements to be a witness in the creation and cancellation of a supportive attorney. You are then responsible for informing your supportive attorney that the appointment is revoked, however, if you do not notify them the appointment is still terminated.